Even as asbestos use increases in Indonesia,1 efforts are being made by civil society groups to generate public, occupational and institutional awareness of the risks posed by the consumption of this acknowledged carcinogen. 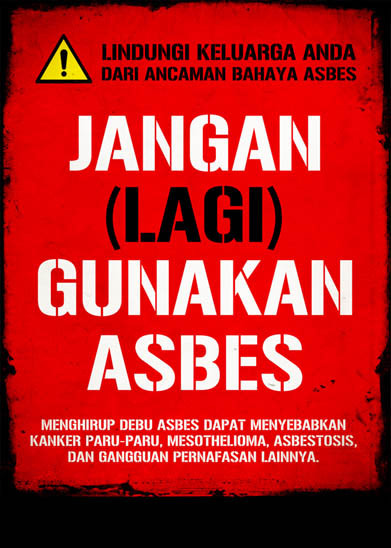 In 2010, a new campaigning group The Indonesian Ban Asbestos Network (Ina-Ban) was formed by health and safety activists, environmental campaigners, trade unionists and representatives from non-governmental organizations such as Local Initiatives on OSH Network (LION), Indonesian Forum for the Environment (WALHI), the Federation of Construction, Informal and General Workers Union (FKUI-SBSI), the Sedane Information Institute, the MOTHER Foundation and Habitat for Humanity, Indonesia. Overturning industry's control of the national asbestos dialogue was never going to be easy or quick. However, since its formation Ina-Ban has become a prominent voice in the Indonesian asbestos debate having taken a leading role in challenging the status quo at home and abroad. Ina-Ban's first Coordinator Muchamad Darisman was one of seven delegates to take part in the historic Asian Solidarity Mission to Canada in 2010.2 The purpose of that initiative was to confront the Canadian public, government officials and asbestos stakeholders with the consequences of Asian use of Canadian asbestos. The media coverage and public support that resulted helped create the climate in which public support for the Quebec asbestos lobby dwindled and pressure grew to phase-out asbestos production. There is no doubt that the Asian Solidarity Mission to Canada and the discussion it generated played a role in the recent demise of the Chrysotile Institute, the mouthpiece for the Canadian asbestos industry. 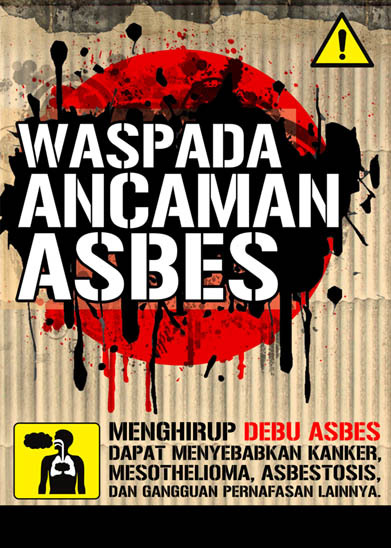 As network building amongst social partners has continued in Indonesia, literature and a series of posters have been produced to provide unbiased information about asbestos to the public and consumers. Issues highlighted in this material includes the human health risk of exposure to asbestos, how to handle asbestos-contaminated waste material and the need to protect members of the public from non-occupational asbestos exposures. English translation: Beware the threat of Asbestos. Inhaling Asbestos dust can cause cancer, mesothelioma, asbestosis and other respiratory disorders. English translation: Protect your family from the threat of Asbestos dangers. Do not use Asbestos (any more). Inhaling Asbestos dust can cause cancer, mesothelioma, asbestosis and other respiratory disorders. 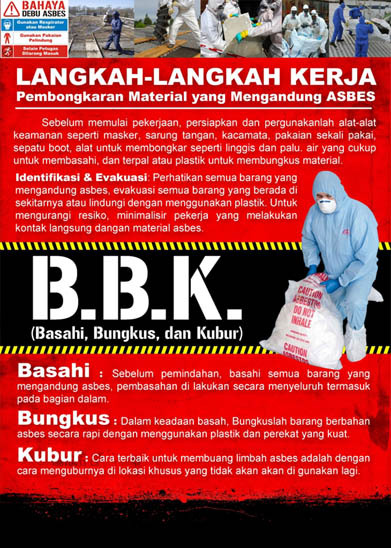 English translation: Necessary steps for removing asbestos-containing material. Before starting work, prepare safety tools such as masks, gloves, glasses, disposable clothing, boots, loading and unloading tools such as a crowbar and hammer, enough water to moisten and plastic sheets for wrapping the waste material. Identification and Removal: Identify all material containing asbestos, avoid contamination of nearby material by removal or protection with plastic to reduce contamination risk. Keep to a minimum the number of people who have direct contact with the asbestos-containing material. Wet: Before removal, dampen all the material containing asbestos, wetting to be performed extensively including on the inside. Wrap: In wet conditions, wrap the asbestos material. Wrap in tidy parcels by using plastic and strong adhesive. Bury: The best way to dispose of asbestos waste is to bury it in a special location where it will not be used again. In 2011, a highly innovative program  the Asbestos Danger Media Competition  was launched by Ina-Ban in collaboration with the Indonesian Red Cross and local partners. The pilot for this educational outreach program attracted great interest and participation from students in junior and senior high schools. This year Ina-Ban has diversified its awareness raising program to include portable advertising: tee shirts. 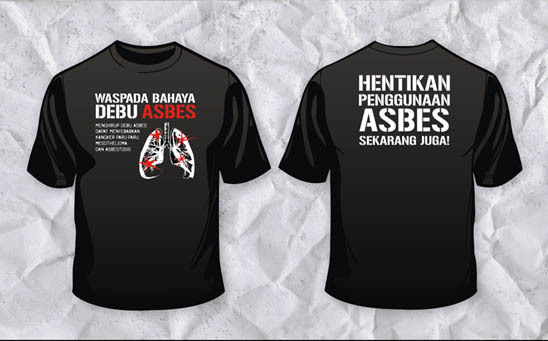 The English translation of what is written in Bahasa on the front of these tee shirts is Beware of the dangers of asbestos, inhaling asbestos dust can cause lung cancer, asbestosis and mesothelioma, while slogans on the back say: STOP using ASBESTOS right now!!! 1 Data on global asbestos consumption and use provided by the United States Geological Survey show Indonesian asbestos consumption for 2008, 2009 and 2010 as follows: 78,037 tonnes (t), 82,302 t, 111,848 t.
2 Darisman M. The Asbestos Frontline. December 9, 2011.